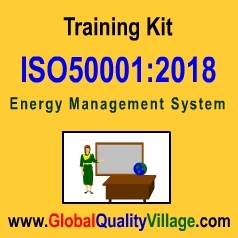 If you plan to implement ISO50001:2011 Energy Management System (EnMS) in your company, you need to impart organization-wide training on ISO50001:2011 and EnMS concepts & requirements. If your company is already certified to ISO50001:2011, there is still a need for imparting training to the new recruits. To learn the steps involved in system design, implementation and ISO50001:2011 certification. What is ISO50001:2011, who issues ISO50001:2011 certificate, Gantt chart of a typical ISO50001:2011 implementation project, etc. Question paper for conducting class test. In case of download version, you can download the kit from our website within six hours of making the payment. (Files compressed in WinZip format, takes just 2 minutes to download). We can also send the zipped file as email attachment, if required. Copyright � 2016 Sirwill Software Private Limited, India. All rights reserved.